Part of a well balanced breakfast, don’t forget to add some weekend links! I saw the Social Network yesterday. Good film, if not wholly accurate. Aaron Sorkin’s writing style – and the dialogue that follows – may not be for everyone, but I always enjoy it. Only a few more films to see before I got all the Oscar nominated films covered. A 230-foot tower is getting planted next to some homes in Duarte. Naturally, they had a few concerns. Glendora became another city trying to keep Gov. Jerry Brown and the state away from their redevelopment dollars. No new taxes, is the familiar cry of many elected officials. But increased fees? That’s totally different. Went over the new contract for Glendora Police Chief Rob Castro who was approved by the council Tuesday. – If he is terminated, will receive 6 months severance. – Will pay full share of the employee portion of CALPERS. Background: Former chief Montoya cashed out $80,000 in unused leave time when he retired in 2009. He credited the ability to use administrative leave in place of vacation in order to save it. Full story in tomorrow’s paper. UPDATED: You can call it. Vulcan wins in a landslide. The votes are in. Those in favor doubled those opposed. Next stop: The mining battle goes to court. See you all tomorrow. The Los Angeles County District Attorney’s Office of Public Integrity said an investigation into the misuse of public funds by Duarte officials regarding an Azusa referendum remains open. Furthermore, Head Deputy District Attorney for the department, David Demerjian, said he doesn’t expect any decisions on the case prior to the special election based on the referendum in question which is scheduled for Tuesday. Azusa Mayor Diane Chagnon alleged in a complaint filed with the district attorney’s office in November that Duarte hired a public relations firm to help with a referendum campaign in Azusa and illegally discussed certain items in closed session. Officials in Duarte rebuked the claims and submitted hundreds of documents to the attorney’s office in response. 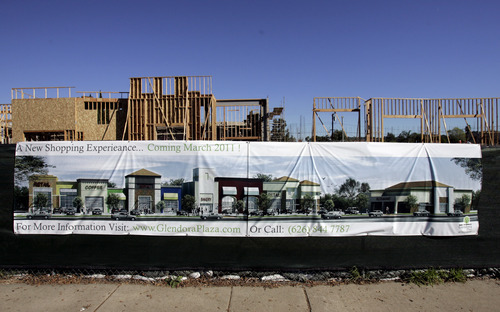 I tried to get the lowdown on the new Glendora Plaza development being built near the corner of Route 66 and Grand Avenue. I called the project’s developer Georges Attar, and I got some basics. It is a 19,000 square foot development with a restaurant pad. He purchased the property a couple years back, but development was slowed by the economy. I asked him about any concerns getting tenants in the building – after all, the Fresh and Easy anchored center just a couple blocks south remains mostly vacant – but he shook it off. “It is a totally different location,” Attar said. For any more details, he referred me to his partner Elie Attar. I called Wednesday and left a message. I called today and spoke to a Frank. He said Elie was out and I should call back. I asked if he would be in today, and Frank’s response was a quick “I don’t know.” In the middle of asking when would be a better time to call back, Frank hung up. I called back to ask when the best time to call back would be, but just after introducing myself again, Frank clamored, “He is not here right now,” before hanging up. I thought about calling back a third time, but realized I would just look foolish when he hung up on me again. The lack of control in a phone call is infuriating at times. Maybe we will get the details in the future, but for now it looks like a dead end. Last night was the Glendora council candidates forum where the seven contenders sparred (not really, more like, politely conveyed their views) over various city issues. First and foremost, I must say that Ken Herman was a gracious moderator. Despite the questionable choice to choose a once candidate, incumbent Mayor to be the moderator that adds the opportunity for someone to cry foul over the forum’s fairness, it wasn’t an issue. Herman read the questions, kept everyone within their allotted time, and commended the candidates as a group. He never singled out a candidate, interjected or gave his opinion. – In a forum where many of the candidates talked about leadership styles, the need to communicate better with residents and listen, incumbent councilman Doug Tessitor showed his experience. – Jason Nagy pulled a John Boehner, choking up during one bit. OK, I feel genuinely bad for that joke. Nagy was clearly passionate last night and often spoke about his run being from his heart. No ill will intended. – Cynthia Carrasco told me she is training for a bicycle marathon. So don’t be surprised if you see some bicyclists with some “Vote for Cynthia” jerseys. – John Fields, while responding to a question about lawsuits from residents, said he felt some lawsuits were based on personal vendettas. He went onto say that some public records requests are also based on vendettas and he wondered if there was a way to filter such requests. Short answer: No. Public records are just that. Public. Anyone person has a right to view them, vendetta or not. – On the flip side, Fields promised to bring some flair and excitement to the council in the form of entertainment. This is actually a pretty good idea. Get people wondering what you might do if elected and maybe you get the curiosity vote. I can dig it. – When asked the fully loaded question of what new state taxes the council candidates would support, the candidates had this shocking reply: None. Who would have guessed? I am glad we got that question out of the way because otherwise who knows what could have happened. – Meg Whitman should have taken some lessons from Judy Nelson. Nelson, a business owner in Glendora, said she had not voted or paid attention to city politics for many years as she focused on her life. She owned it. “I learned that is the wrong way to go,” she said.